June 14th - Email sent to applicants. July 1st - Hand over sims to Round 11 recipients. It's time for the next round of the LEA Artist-in-Residence Land Grants! The LEA Land Grant program seeks to promote and nurture the arts in Second Life, through a six-month land grant to recipients. Recipients can be individuals or groups interested in creating or curating art, or proposing cultural projects which would require/utilise a full-sim build and can be completed within the allotted time frame. 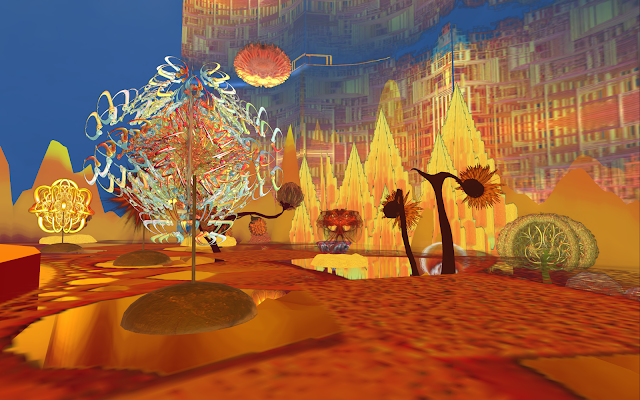 The LEA is able to offer land grants through the generosity of Linden Lab. You. And the LEA. We are looking for projects that utilize the many possibilities available in the virtual world. This is not limited to visual art; we encourage applications that are also collaborative efforts across the spectrum of the arts, including performance, music, and film. We encourage Second Life residents at all levels to apply, and also suggest residents might form groups and apply together if they don't feel they're able to fill a sim on their own. Land grant recipients are expected to complete a project and open it to the public within the 6-month grant period. This has often been in the form of a full-sim art exhibition and/or immersive installation, but we also welcome applications which propose curatorial projects, especially those which have a connection to physical exhibitions and events ('mixed reality') by individuals and arts groups. The LEA would also prefer that projects be original works for this installation, though of course curators might be presenting existing works. Recipients will 'buy' (at zero cost) a full sim's-worth of land from the LEA. You will own the land and be able to deed it to your group, and so forth. You will also be an estate manager for the region as well. This gives you a great deal of expressive control over the region, such as setting windlight and terrain textures. We can help with owner-level management such as terrain RAW files. Artists should take no more than 3 months to execute their build, so that all sims have open work during the last 3 months of their grant. This, however does not mean you cannot open your project earlier than the 3 month deadline, and in fact many artists in the past have used their land to have multiple exhibits. However, it's important that your project will be ready within 3 months, and this time-frame should be considered (and reflected) in your application. In addition to completing and presenting their art works, recipients must also uphold the LEA Code of Conduct. Recipients will also be expected to present at least one event at some point within their residency. This could be an art opening, or it could be lectures or demonstrations. It could be an ongoing event, as well. In addition to providing land and estate management support, the LEA wants to help make your project a success. You will be assigned a liaison from the LEA Committee, who will help guide you through the land grant timeline, land management, PR planning, and provide information about other helpful resources.